On May 8, 1972, Father Gobbi, an Italian priest from Milan, was on a pilgrimage to Fátima, Portugal and was praying in the Shrine of Our Lady of Fátima for some priests who had given up their vocations and were reportedly planning to rebel against the Roman Catholic Church. On that day he reported his first alleged interior locution from the Virgin Mary. Father Gobbi reported that the inner voice urged him to have confidence in the Immaculate Heart of Mary and to gather those priests that would be willing to consecrate themselves to Immaculate Heart of Mary and be strongly united with the Pope and the Catholic Church. According to Father Gobbi he prayed to Saint Mary for a confirmation of the inner voice, which he reported as receiving later in May 1972 while praying in the Church of the Annunciation in Nazareth. Most messages have a somewhat maternal tone and they often ask the faithful to follow Jesus and not deviate from His path. For instance, message number 110 of September 25, 1976, warns against diluting the words of the Gospel and creating “your own Gospel with your own words” rather than following the original teachings of Jesus. Pope John Paul II, who had a personal devotion to the Virgin Mary, met with and celebrated mass with Father Gobbi in his private papal chapel in the Vatican on an annual basis for several years. In November 1993, Pope John Paul II also provided an official papal blessing for the American branch of the MMP in St. Francis, Maine, but did not offer an imprimatur for the book. The fundamental concept of the MMP today remains the same as the basic concept expressed in the initial interior locution that Father Gobi reported on May 8, 1972, in Fátima, Portugal. The concept is to encourage priests and laity to unite with the Pope through the Immaculate Heart of Mary to strengthen the Catholic Church. 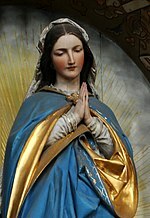 The MMP does not have its own distinct doctrine for consecration to the Immaculate Heart of Mary but relies on the general consecration doctrine provided by the Holy See. The concept of unity and devotion to the Pope also embeds the concept of a return to the original divine teachings of Jesus which the MMP views as being diluted through modern human interpretations and multiple rationalizations. The concept of leading the faithful to the Virgin Mary is essentially expressed in message number 25 of November 1, 1973, in which priests are asked to gather the faithful around them as "invincible cohort" to follow the path of Jesus. Father Gobbi has held cenacles of varying sizes on every continent. The cenacle he held in Ōita, Japan, on June 2, 1978, was for a few priests and nuns while the cenacle he held in Mexico City on November 27, 1994, was attended by 20,000 people in the city stadium. This page was last edited on 26 October 2018, at 04:46 (UTC).